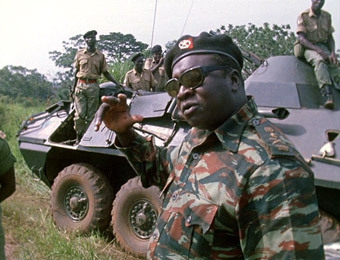 I'm old enough to remember General Idi Amin but was too young to have had an informed opinion on him when he was in power. I'll wager a large proportion of the generation that followed hadn't even heard of him until his elevation to poster boy though the release of Kevin Macdonald's excellent The Last King of Scotland last year. In retrospect he seems like one of a stream of African and Middle Eastern leaders that the West was instrumental in training and welcoming to power and then later condemning when they saw what they had helped to create. 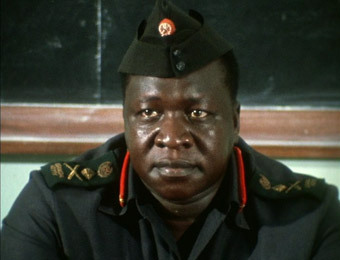 Amin very much fits this profile, joining the King's African Rifles in the British Colonial Army in 1946 and later rising to the rank of Commander in the Ugandan Army, then seizing power from Prime Minister Milton Obote in a military coup in 1971. It was a popular uprising both at home and abroad, the British Foreign Office seemingly overjoyed with this "splendid" fellow. But it didn't last long. The persecution of ethnic groups and the expulsion of all Asians in what Amin called an "economic war" quickly soured international relations. Amin himself broke of diplomatic ties with Britain in 1972 and the USA closed its Kampala embassy the following year. Bodies of the disappeared began to turn up in the Nile – a lot of them – and Amin's behaviour became increasingly erratic. He even began awarding himself non-existent honours (after Britain broke off diplomatic relations in 1977 he made himself a CBE, a Conqueror of the British Empire) and came close to declaring war on both Kenya and Tanzania, the latter move backfiring and forcing him, in 1979, to flee the country, never to return. During his time in power, reports in the western press too often painted him more as an egotistical buffoon than a serious threat to his own people, but then few seemed able to get truly close to him for an extended period of time. One notable exception was the director and former Cahiers du cinema contributor Barbet Schroeder, who in 1974, with the full co-operation of Amin at the height of his power, embarked on a documentary portrait of the Ugandan president. The resulting film, with the exception of a few telling scenes that Amin ordered Schroeder to remove (more on this below), actually serves to bolster this commonly perceived image, with Amin coming across as energetic, good humoured, intermittently charming, and just a little bonkers. Initially Amin paints an engaging portrait of himself as a man who has struggled up from the bottom and who is loved and respected by his people for his honesty. "The reason people like me," he tells Schroeder, "is that I always tell the truth, and if I haven't anything good to tell them I keep quiet." He takes Schroeder on a river trip and talks warmly about the animals that live there, and later even appears to be taking over the role of director, enthusiastically encouraging cameraman Néstor Almendros (the award winning cinematographer of L'Enfant sauvage, L'Histoire d'Adèle H., Sophie's Choice and Days of Heaven) to grab a shot of a passing helicopter. He jumps with tribesman and plays accordion (very well) with a dance hall band, he claims that the Ugandan political system is neither capitalist nor communist but is made up from the best bits from both, and his proclamation that women should be good homemakers gives rise to the assertion that they would thus also make excellent hotel managers, and orders are given that any man who does not obey his new female boss is going to be out of a job. Even his seemingly barmy idea of organising food parcels for a then strike-beleaguered Britain comes across as a witty prank, his apparent request to then prime minister Ted Heath for a transport plane to ship them to the UK going strangely unanswered. But elsewhere there are moments, however light-heartedly delivered, that suggest Amin's darker side and his increasing megalomania, visible in his demands to his cabinet that they work harder to teach the people to love their leader, in his proclamation that he is able to dream the truth and that he knows the exact time, date and method of his death, in his plans for an international suicide squad to attack Israel, and in his lack of sympathy for hijack victims because of the airline they chose to fly with. Read between the lines and the signs are also evident in the smaller details: the swimming race he takes part in that no-one else dare win, the hastily withdrawn use of the word 'president' to refer to the head of the Uganda Medical Association (under Amin's rule only he could be referred to by that term), the nervous faces of those who dance to his accordion playing, and the silent obedience of his cabinet ministers. The now restored cuts are sometimes more direct in their criticism and were re-inserted into the film only after Amin's deposition and exile. Amin's demand for their removal was initially refused by Schroeder, but the director acquiesced when a group of 150 French citizens living in Uganda were rounded up, held in a hotel surrounded by soldiers and given Schroeder's home phone number to plead for his compliance. The surprise is that Amin objected to so little, presumably happy with material that to an outsider may seem slyly critical and with statements of his own that seem to us either foolish and/or alarming. As a documentary portrait in its own right, Idi Amin Dada is an uneven and occasionally rambling affair – a cabinet meeting is allowed to play out past when the point of the scene has been made, and a particularly long interview is broken up by sometimes decorative footage such as bats taking flight, although maybe I'm missing some clever symbolism here. There's little of the drama and tension of Nick Broomfield's 1991 portrait of South African neo-nazi Eugene Terre'Blanche, The Leader, The Driver and the Driver's Wife, although Schroeder from the start stated that he never went in looking to be critical, he just let Amin be himself and do the job for him. As a stand-alone film it's certainly intriguing and even entertaining, but with the UK DVD release co-inciding with that of The Last King of Scotland it takes on a very particular interest. 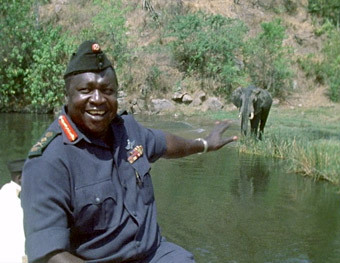 If you were gripped by Kevin Macdonald's film and particularly Forest Whittaker's extraordinary performance as Amin, then General Idi Amin Dada Autoportrait should prove fascinating viewing and be considered must-see. This appears to be another of Masters of Cinema's licences from Criterion, whose own DVD release dates back to 2002. Shot on 16mm Ektachrome on the expected aspect ratio of 1.33:1, the transfer is only a whisker short of excellent, with colour, contrast and detail as good as you would hope for such source material. Grain is visible but never distracting and although there is some flickering of colour stability on a couple of sequences, this is not particularly intrusive and doesn't last long. The disc is, as with the MoC releases of Salesman and Grey Gardens, in the NTSC video format. There is no regional coding. The original mono soundtrack is clear enough, despite a couple of reviews of the Criterion disc that suggest some of the dialogue is lost to fluff and mumbling. Optional English subtitles for the hard of hearing are available, but I didn't find a reason to switch them on. There are no extras on the DVD itself, but as usual Masters of Cinema have supplied a very well produced and informative Booklet, this one containing a 1976 interview with Barbet Schroeder, Schroeder's own breakdown of the cuts imposed by Amin and a 1975 article in which Dr. Tilo Held psychoanalyses Amin, making specific references to scenes in the film. A structurally loose but still interesting portrait of a charismatic despot who seemed blissfully unaware of how his words would be interpreted by outsiders. The UK DVD release is perfectly (and perhaps deliberately) timed to pair it with Macdonald's widely heralded drama and they make a fascinating pair. For once the Criiterion disc doesn't have enough in the way of extras to really give it an edge, so the Masters of Cinema DVD is, for UK viewers at least, the logical way to go.